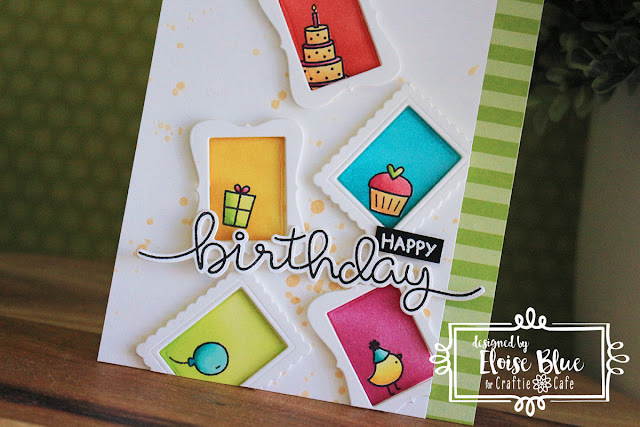 Hi everyone, today I'm here for Craftie Café and I’ll be using a planner stamp set from Lawn Fawn along with a few frames from Taylored Expressions to create a birthday card. To begin my card today I first went ahead and cut out 6 frames from the Taylored Expressions MiniFrame dies. I kept both the frame and the inner piece as the inner pieces is where I’m going to do my stamping. I then used the Lawn Fawn: Plan on It Birthday set and stamped out some of the small images from the set onto my rectangle pieces with some black ink. I also stamped them onto some full sticky post it notes for masks. Once I finished my stamping I went ahead and cut out the masks with some fine detail scissors and placed them over my images. 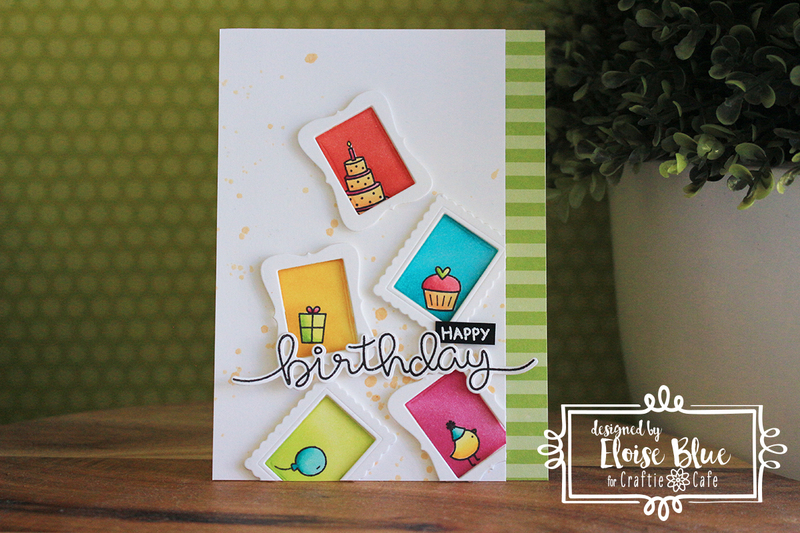 I then used some Distress Inks to colour each of the different rectangles. Once I finished my ink blending, I used some Copic Markers to colour in all my images. Next up, I cut down another piece of white cardstock and splattered some gold shimmer mist over the bottom right hand corner. Then, added foam tape onto the back of my frames and adhered them down in the bottom corner also. Then I used some flat adhesive to adhere down my coloured pieces inside each of my frames. To finish up, I used the Scripty Big Words from Lawn Fawn stamp set, stamped down the Birthday sentiment with black ink and die cut it out using the coordinating dies. I then adhered that onto the panel also using foam tape and to finish up my sentiment, I used the ‘Happy’ sentiment from the planner stamp set and white heat embossed it onto a strip of black cardstock and also adhered that onto my panel. I cut down a strip of green striped cardstock and adhered it down to the right hand side of my card base, then my panel next to it. Link to the video is down below. That finished up my card today, I hope you enjoyed and got inspired to use planner stamp sets to create a card. Thanks so much for stopping by and I’ll catch you next time. Your card is so lovely !! The teeny tiny frames are adorable ! I really like this card, it's so cute.